Here is a WiP post, since it’s Wednesday! I’m trying to stick to a semblance of a blogging schedule, but so far this year it hasn’t turned out so great. But there’s a post today, and there will almost certainly be a post on Friday, so that’s a start. 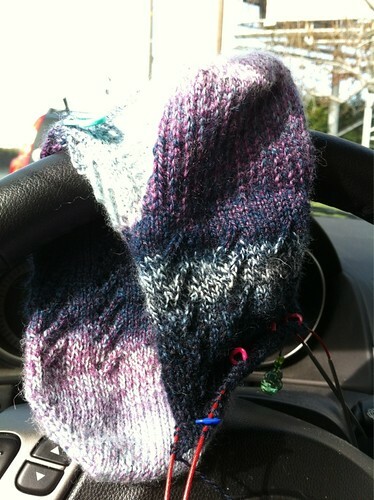 The Last of the Sky Pirates mitts! These are a really fun knit, as long as I can ignore the way the pattern is worded. It’s a good pattern, in that I didn’t find any errors and the design is nice. However, I think it’s the designer’s first published pattern, and it reads that way. You know how beginner knitters will often want everything spelled out for them? Knit this many stitches, and then do that, and then purl these stitches, and end by knitting this many more stitches. And they want that for every single row? Well, they would love the way this pattern is written. However, I would much prefer a simpler wording — something like, “On WS rows, K1, continue in pattern until last stitch, K1.” That right there would remove half of the directions. 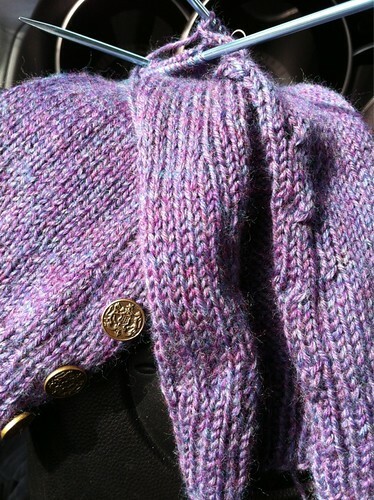 And there are more things that could be done to make this a more advanced-knitter-friendly pattern. 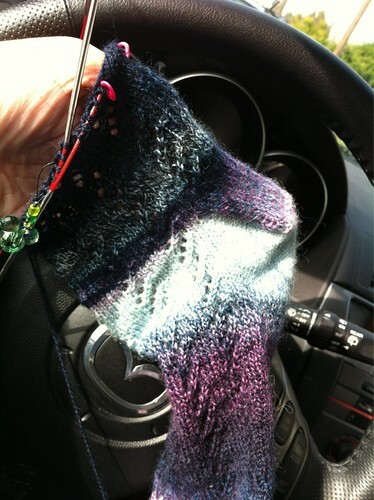 The next (and last) WiP I will show off today is the first Waterfall sock! The yarn is a Crazy Zauberball, and I love it. I want more! It’s so much fun watching how the yarn changes colors. I love my Chiaogoo needles, too. But I have a confession to make. It seems I can’t read needle packages. You see, when I bought these needles, I went to the rack holding size US 1 (2.25mm) needles, and got two 16″ circulars. And bought them, and put the sock on them, and knit away. And knit, and knit, and knit, and only when I’d gotten about 2-3 inches past the heel turn did I notice that one needle is a 2.25mm, while the other is a 2.5mm. (AKA US1 and US1.5) Um. Not a matched pair of needles, after all. Oops. So, guess where I went yesterday? Yup. Back to the store to buy needles that actually MATCH in size. knitting mitt love sock it to me WiP it! LOL! But you’re going to knit the second sock with mismatched needles, right? So the socks match? The Crazy Zauerball is so pretty! I love your Mitts, too! The sock color is so gorgeous! I’m having similar issues with a pattern I’m knitting. It’s both overthought and underwritten. The one really lovely thing out of it though is that I can finally read charts without having to refer the the symbol key all the time. In fact, I can’t believe I had to do that.